MADISON, Wis. — The Kosovo War was an armed conflict in Kosovo, a borderland between Serbia and Albania, that lasted from February 28, 1998 until June 11, 1999. The conflict was between two forces: the Federal Republic of Yugoslavia, which had previously controlled Kosovo, and the Kosovo Albanian rebel group, known as the Kosovo Liberation Army (KLA). The North Atlantic Treaty Organization, or NATO, provided air support to the KLA and the Albanian army provided ground support. About 90 percent of Albania’s Kosovar population was displaced during the war. Here are some striking images that show the faces behind the statistics. The wife of a Serbian policeman cries over her husband’s coffin during an Orthodox funeral ceremony in the village of Brestovik. It has been projected that at least 10,000 people died in the war, and that more may have died in several incidents after the conflict officially ended. While Serbian police run through tear gas during riots in the center of Pristina, an ethnic Albanian demonstrator fights to breathe after he was beaten by the Serbian riot police in March 1998. 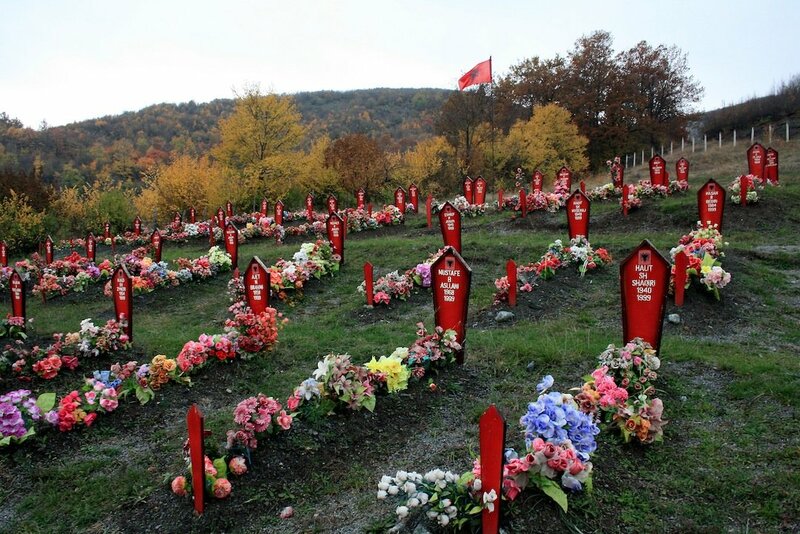 After this incident, Serbian security forces massacred over 50 members of the Jashari family in the village of Prekaz. In following weeks, tens of thousands of people rallied back in Pristina to protest the massacre, but the Serbians responded with counter-demonstrations, which led to more violence. Ethnic Albanian demonstrators are drenched by a riot police water cannon in the centre of Pristina. It is commonly known today that there were many war crimes committed against ethnic Albanians during and after the conflict. A recent leading Kosovo Serb politician, Oliver Ivanovic, was arrested for these war crimes in January 2014. A group of ethnic Albanian children refugees from Kosovo demonstrate their support of NATO air strikes. NATO set out objectives for their involvement in the Kosovar crisis in April 1999. Their main objectives were to stop all military action and immediately end the violence and repression, create an international military presence in Kosovo, organize unconditional and safe return for all refugees and displaced persons and to establish a political framework in the country that aligns with international law and the Charter of the United Nations. Kosovar refugees in line for registration at a Red Cross tent. More than 25,000 ethnic Albanians from Kosovo waited between Macedonian and Serbian check points at the border crossing. There were over 3,100 tons of food delivered by the U.S. to refugees during the conflict and over $5.05 billion spent on air campaigns, peacekeeping and refugee assistance through the end of the war. Ethnic Albanian woman Fluter Pllana, 18, cries in front of the burning house of her uncle after Serbian police and troops set fire to the house. Many Serbian police were bitter about the outcome of the war, so they set fire to dozens of ethnic Albanian homes as a final show of power. Hundreds of Kosovo neighborhoods were turned into tracts of scorched homes due to these fires. Ethnic Albanian children cry outside of their home where their two young parents were killed from a Serbian mortar bomb fell into their courtyard. Both the Serbian forces and NATO used many thousands of bombs during the conflict as part of their offensive strategy. Groups watch as a B-52 bomber lands at RAF Fairford. These bombers were sent as part of NATO’s preparations for air attacks on Yugoslavia. The NATO offensive, which lasted for 78 days, came in response to ethnic cleansing launched by Serbian forces against the Kosovar Albanians. A crying Kosovar refugee child, carried by his father, is helped by a man as they try to climb a hill at the Blace border crossing. At rates of over 1,000 per hour, refugees walked and drove out of Kosovo into Albania, Macedonia, and Montenegro due to a campaign by Yugoslav forces to rid the province of ethnic Albanians. This was one of the largest forced exoduses in Europe since the end of World War II. About 5,000 ethnic Albanians celebrate in a town in central Kosovo on July 17, 1999. On June 20, 1999, Serbs completely withdrew from Kosovo and Secretary General Solana formally ends NATO’s bombing campaign. The next day, KLA agrees to disarm due to NATO pressure.